In 2014, Sonam Wangchuk, who believes that science is beneficial only when it can be applied to everyday problems, decided to improve a water harvesting design created by ªice manº Chewang Norphel so that more people could benefit from the innovation. Norphel, a rural development engineer, had built the first artificial glacier in 1987 in Phuckche village with the help of people who had been facing a severe water shortage for a long time. 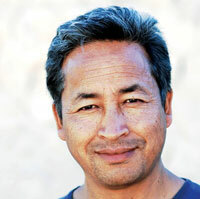 Wangchuk, one of the founders of the Students’ Educational and Cultural Movement of Ladakh, many say, is also the inspiration behind the character of Phunsuk Wangdu or Rancho in Three Idiots, a popular Bollywood film. 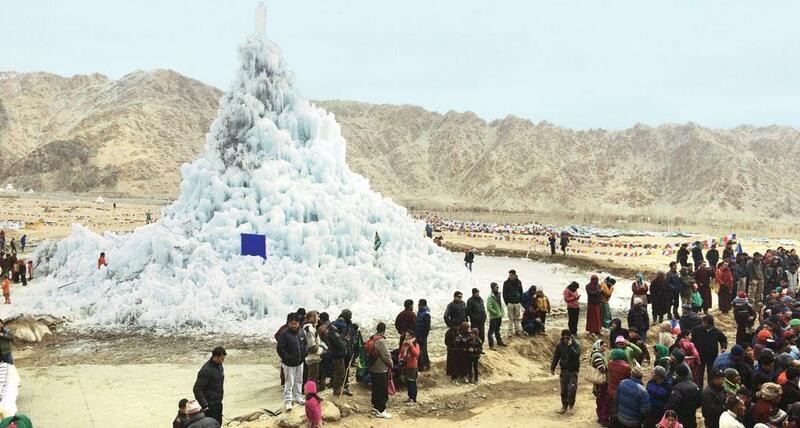 To build a prototype, Wangchuk, along with a group of students from his school, built a giant cone of ice in Phyang, about 10 km from Leh city, and called it the ice stupa, as it resembles traditional Buddhist monuments. This was built at an altitude of about 3,200 metres and lasted for about four months. 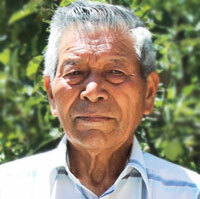 “I once saw ice near my school at a height of 3,000 metres. That is when I first thought that a glacier can be made at a lower height as well,” he says. After the success of this cone, a pilot project was implemented in the winter of 2014 with the help of local communities. To do this, Wangchuk raised an online crowdfunding of nearly US $120,000. It was later supported by the head of the Phyang monastery. To construct these glaciers, river water is brought down the mountain slope in pipes buried 1.8 m underground. The lower end of the pipe is bent to form a nozzle, which juts out of the ground. Water sprinkles out of this nozzle and, since the temperatures in these regions hover around -30°C, it freezes and settles on a wooden frame, taking the shape of a cone. The length of these pipes is 50-60 metres. “Science says that the water coming out of the lower end of the pipe attains the height from which it was drawn upstream. Therefore, we were able to make the water at the lower end of that pipe rise many stories high, simply by ensuring that the other end from where we are drawing water is higher upstream,” explains the engineer. The glaciers are then adorned with Buddhist prayer flags that helped in partial shading from the strong spring sun and as a wind- break against the warm spring winds. Thus, the structure is a synergy of science as well as tradition. The stupa managed to reach a height of 20 metres, storing about two million litres of water. During summer, it melted to shed 3,000 to 5,000 litres of water every day. Water from this stupa was used by the villagers to plant 5,000 poplar and willow trees in 2015. These trees require about 10 litres of water a day, and their economic value stands at around Rs 8,000 per tree. For years, people of Ladakh, a land of scenic brown- and purple-hued mountains, have survived on glacier waters that flow down the streams. But with global warming and changing weather patterns, the residents have been forced to look for alternative sources of water for domestic as well as agricultural needs. The land, that once used to bear a bountiful harvest of wheat, barley and other crops, now remains parched. For a region that receives average ann-ual rainfall as less as 50 mm, glaciers are a lifeline. According to the Jammu and Kashmir’s State Action Plan on Climate Change, studies conducted by the National Institute of Hydrology, Roorkee, reveal that the glaciers have been receding for last three decades in Ladakh, Zanskar and the Great Himalayan ranges in the state, with the majority of them showing a depletion of 17 to 25 per cent. But depletion of glaciers is not the only problem. While the glaciers start melting in June, the region’s main crops—barley and green peas—need water during their sowing season, which begins in April. The situation is critical as no crop can be grown here during winter. Moreover, as the region has a very short summer period, if the crops are not sown in time, they cannot fully mature. So timely availability of water is critical. Ladakh got its first artificial glacier in 1987 when Chewang Norphel, with a crowdfunding of US $25,000, made structures that looked like fields of ice at an altitude of 5,273 metres. Norphel also sought the support of the local population, who worked as labourers. These artificial glaciers were flat structures constructed in the shade of a mountain at a very high altitude. They were constructed in the form of small stone embankments that impeded the flow of water to form shallow pools that can store water. The tanks helped to conserve water that would have otherwise melted and flown down the stream. These artificial glaciers were cons-tructed at different altitudes, and they would start melting during spring and supply water to the residents throughout the sowing and irrigation season that lasts from April to July. But the design of these structures had a limitation. They needed to be located in mountain shades so that the ice did not melt quickly. Moreover, the embankments requi-red maintenance to ensure that the water did not leak on melting. This is where Wangchuk has taken the initiative forward. While Norphel’s design of constructing glaciers could be implemented only in areas facing north so that they get limited sunshine despite being in shade, Wangchuk’s version does not have this restriction, and can be installed even at lower altitudes. Moreover, Wangchuk’s design of building conical ice structures uses minimum surface area with maximum volume. This also prevents spring sun and wind from melting the ice. This gives Wangchuk’s design an edge over Norphel’s structures where water was collected in small flat pools, thus exposing more area to the sun, for a given volume of water. Wangchuk says his design is not a labour-intensive one and can be maintained by just one person. “It is almost like 3-D printing of an ice cone. The difference is that we are using more science to prevent wastage. When we can store water in the sky, why go for dams,” says Wangchuk, who is planning a full-scale project with 30-50 glaciers in the same village this winter.